My name is Madison Arnold and I’m an undergraduate ASU student majoring in journalism and innovation in society. This month, I traveled with the SolarSPELL team to the field for the first time. 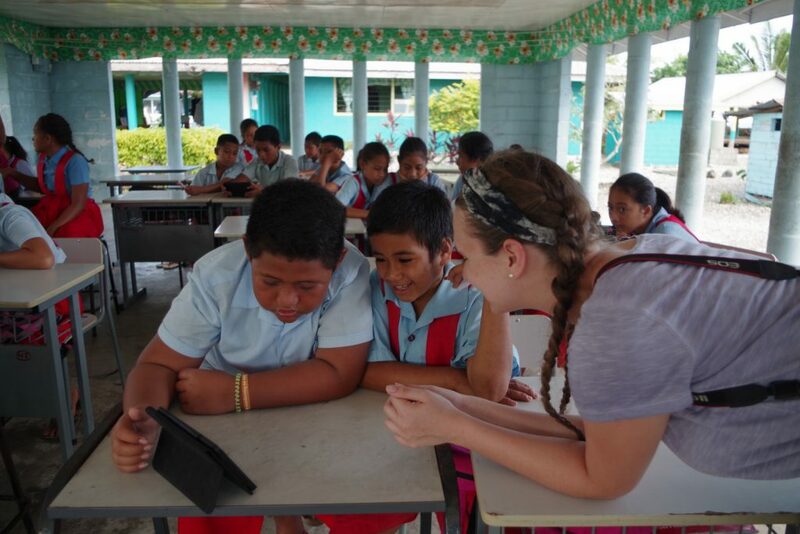 We went to Samoa to visit schools, conduct follow up interviews with Peace Corps volunteers to discuss their use and experience with SolarSPELL, and train the next cohort of Peace Corps volunteers and counterparts (local teachers) to use the SolarSPELL in their schools and communities. For me, the most worldview-altering story of how SolarSPELL is changing the way students and teachers are learning occurred at Peace Corps volunteer Karen’s school. Cyclone Gita hit Samoa in February of this year and the destruction caused Karen’s school building to be shut down. The school was in poor condition before the cyclone hit, therefore the storm damage made the area unsafe and unusable. Their “school” was moved to a field area and classes were being held in fales, which are traditional Samoan houses that are open air and do not have walls. Karen and Selena, the counterpart teacher that she brought to SolarSPELL training last May, used the SolarSELL digital library in their classes regularly and taught other teachers how to use it as well. The students, especially the year seven students that Selena taught, were familiar with the SolarSPELL. When their school was destroyed, that meant that most of their paper materials were also unusable. The SolarSPELL allowed the students to continue learning, uninterrupted, outdoors. Class could continue with meaningful and valuable lessons because the information was readily available for them to continue learning. There wasn’t a learning curve or a waiting period for students and teachers to learn how to use the SolarSPELL as an alternative teaching tool, because the students and teachers were already incorporating it into their classrooms or consulting it for resources prior to Cyclone Gita. Students’ and teachers’ ability to adapt and continue learning despite their school being rendered unusable was remarkable. In Selena’s classroom, students were reading along to “Voice of America” videos that they navigated to by themselves on tablets. I was amazed to see students using SolarSPELL on their own and to hear Selena talk about how SolarSPELL was not only a resource for her students, but to refresh herself on concepts as well. From the first time I heard about SolarSPELL, I knew that providing teachers with more resources could mean a stronger and more impactful learning environment. I did not know that SolarSPELL could be a complete game changer in the academic lives of these students and teachers. Because SolarSPELL is solar powered, ruggedized and portable, after Cyclone Gita learning could resume with less disruption. The most eye-opening part of this experience for me was that SolarSPELL was not only a digital library to the students and teachers at Karen’s school, but a tool that allowed for resilience in learning, even after losing access to their school building!